Why green you ask? They are made with recycled magazines. Everyone has them, not sure we feel good about just filling the garbage can with them... so do something productive with them. Here's how... 1st - rip em' up. Fold them into cone shape. You can rip them into any size you want. secure them with clear packing tape. Tuck in the open edge to form a nice top that you will later affix the "greens" to. 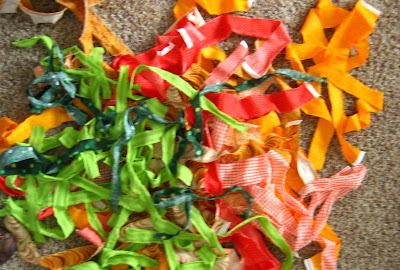 get ORANGE fabrics and rip them into 1"-2" peices. using this... spray adhesive wrap the fabric peices around the cone. caution: do not try doing this on your inside coffee table... this glue is messy!!! The point is a little tricky... I found that when you get to the bottom make sure you have plenty of adhesive and pull back on the fabric the opposite way that you wrapped the entire carrot. This way you have a tight point. Then trim excess fabric. for the "GREENS" rip green fabrics and fold like so to form 4 loops... tie them in a knot. I'm loosing patience with my camera and photo skills... here's the best I could do to catch the final result. There you have them... a whole garden of "GREEN CARROTS"
Very cute idea. Preston would have them in his mouth for sure. DId you get Bountiful Baskets this week? Great tutorial! You should link it on to the link parties at bluecricketdesign.blogspot or somewhatsimple.blogspot or tipjunkie. Love it! Really now!? These are so fabulous!